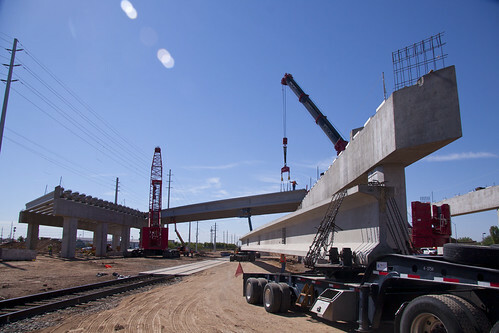 Setting girders for an overpass carrying Bell Road across Grand Avenue (US 60) in Surprise is another sign that ADOT is on track to: (1) reopen Bell Road by November; and (2) create a modern traffic interchange that will relieve traffic congestion. Check out the time-lapse video above and the photo slideshow below to see the latest progress on this $41.9 million project. Bell Road has been closed between Dysart and Litchfield roads since April 1 to ensure the overpass reopens before the holiday shopping season kicks off. The entire project, with ramps to and from Grand Avenue, will be completed by next spring. In all, 89 steel-reinforced concrete girders will be set in place. They range from 67 to 158 feet in length and weigh up to 90,000 pounds. Crews have also been building a new wider section of the westbound lanes of Grand Avenue near Bell Road. When major portions of the bridge deck for the east half of the overpass are in place, plans call for Grand Avenue traffic to be switched to reconstructed westbound lanes beneath the Bell Road overpass structure. For the most updated information on construction, visit our Bell/Grand project page.